I’m trying to get creative with the overflow of vegetables and herbs from my garden. I’ve learned that one basil plant is plenty than the three that I planted. Anyone want some fresh basil? So what to do with all the basil I’ve been growing besides eating? Make basil flower arrangements. 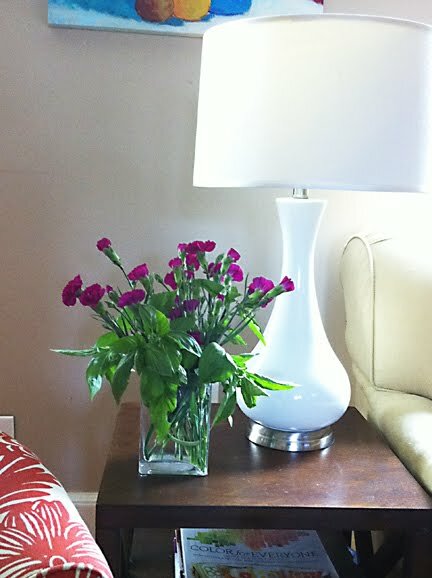 I bought small maroon carnations from the store and added fresh basil to make it fragrant and full. I have three arrangements around the house and love it. The basil does very well in the vases. that's too funny! I'm doing the same thing with my mint. It's everywhere right now. It smells delicious though with our white daisy's.